Has it really been near on 40 years since Geoff Muldaur first hit the scene as a member of Boston's Jim Kweskin Jug Band? 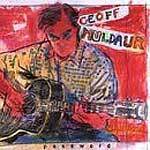 The hopeful hippie mentality may have been nearly expunged from our consciousness by the vicious cynicism of the Clinton years, but Muldaur's gentle folk music recalls a more optimistic time. His new album, "Password," contains some of his best storytelling ever coupled to great musicianship, all underpinned by a true sense of fun. Not all the stories Muldaur tells here are his own  he covers songs by Blind Willie Johnson, Charlie Patton and Sleepy John Estes, among others. There are a few traditional folk songs, and two new songs by Muldaur himself. Dave Alvin sits in on acoustic guitar on four cuts, Van Dyke Parks takes a turn on pump organ and accordion, Kate and Anna McGarrigle provide some harmony vocals, and the recently departed John Sebastian laid down a track of harmonica. The neat thing is that every one of these veterans shows they've lost not a thing to age, conceded not a whit of optimism to the prevailing winds.